People may continue to eat offending foods unaware of their potential adverse effects. Symptoms associated with food sensitivities may occur hours or days after the offending food was eaten because IgG food antibodies remain for a much longer time than traditional IgE antibodies. As immunological reactions, IgE food allergy causes the release of histamine, producing an immediate hypersensitivity reaction, in which symptoms appear within minutes or hours. In contrast, food sensitivity is a non-IgE allergy characterised by the measurement of IgG antibodies specific to antigenic food proteins. 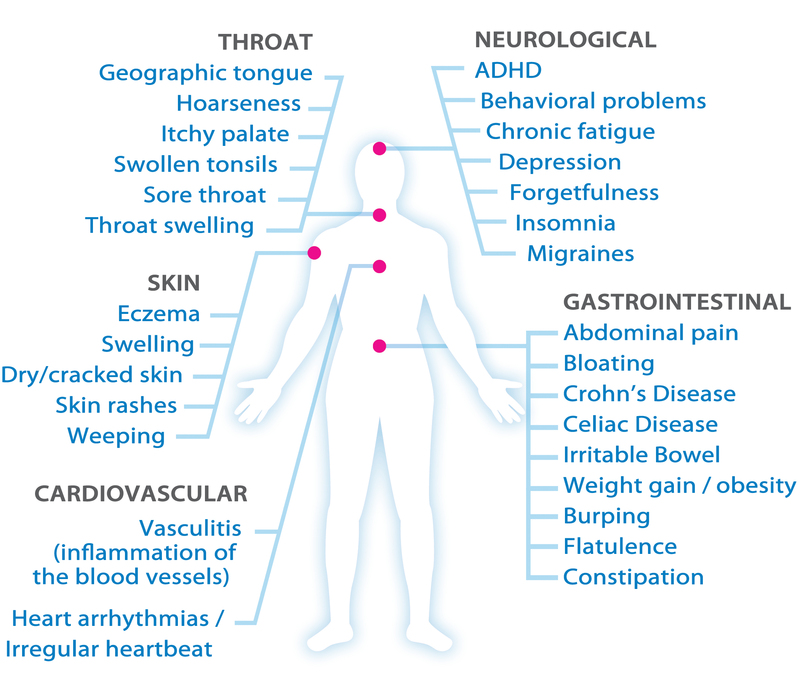 This IgG food allergy is a delayed hypersensitivity reaction in which symptoms appear anywhere from hours to days after eating the offending food. Elimination of IgG-positive foods may improve symptoms of irritable bowel syndrome, autism, AD(H)D, cystic fibrosis, rheumatoid arthritis, and epilepsy, according to numerous clinical studies.1-8 The 93 foods tested for in the IgG Food Allergy Test w/ Candida include most classes of problem foods that can be eliminated from a patient’s diet. The Great Plains Laboratory is the only lab that tests for Candida albicans (a microscopic fungal organism and pathogenic yeast) as part of IgG food testing. High levels of IgG antibodies to Candida have been found in patients who reported many symptoms of yeast overgrowth. Candida problems are caused when the benign yeast form of Candida albicans mutates to its fungal form and produces a buildup of toxins in the body. Candida can overgrow areas of the intestinal mucosa resulting in numerous symptoms, including creating microscopic holes in the lining of the intestines, leading to what is commonly known as “leaky gut” syndrome. If Candida albicans proteins enter the blood, an inflammatory immune system response may be triggered. A wide range of disorders have been linked to Candida overgrowth including autism, multiple sclerosis, depression, chronic fatigue, fibromyalgia, migraines, and irritable bowel syndrome. Immunocompromised patients with cancer or AIDS can have life-threatening complications if Candida enters the bloodstream, resulting in systemic candidiasis. Use of antibiotics, oral contraceptives, chemotherapy, anti-inflammatory steroids, and diets high in sugar and starch increase susceptibility to Candida overgrowth. Research has revealed a relationship between health of the gastrointestinal tract and overall well-being. Imbalance between good and bad bacteria (dysbiosis) has been shown to worsen behaviour disorders, hyperactivity, aggression, and cause fatigue. Evidence is mounting that dysbiosis impairs the immune system and contributes to food allergies, digestive disorders, nutritional deficiencies, and cognitive dysfunction. Using the IgG Food Allergy Test with Candida will help identify food allergies and Candida sensitivity that may be creating a variety of problems for patients. Practitioners may then recommend elimination of the identified foods and supplementation with various natural products that control Candida overgrowth and assist with healing of the gut. Depending on the levels of Candida and the severity of a patient’s symptoms, further testing may be recommended, including a Comprehensive Stool Analysis or Organic Acids Test. Candida-specific immunoglobulins are present in the specimens of virtually all individuals tested. The scale provided shows a clear indication of clinical significance and is established according to population percentile ranks, obtained from a random subset of 1,000 patients. Specifically, the range of insignificant and low IgG values correspond to the first and second quartiles of the distribution, while moderate values denote individuals in the 51st to 97.5th percentiles. Those with an IgG value greater than the 97.5th percentile are considered to have a high concentration of Candida-specific immunoglobulins. IgG is the major antibody found in serum. 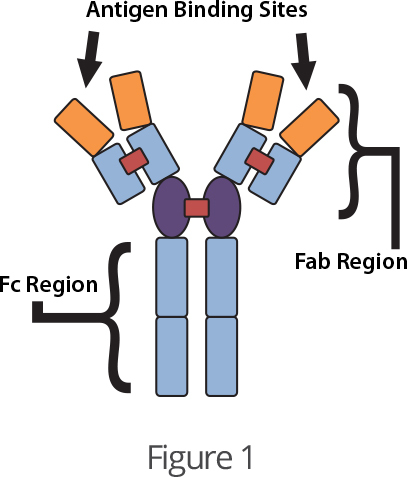 IgG’s are composed of two fragment antigen binding (Fab) regions that contain the antigen binding sites and the Fc region, which is responsible for most of the biologic activity of the antibodies (Figure 1). An antigen is a substance that causes the immune system to produce an antibody that specifically reacts with it. IgG-mediated reactions to food antigens may be delayed by several hours or days, whereas IgE food antibody reactions are quite immediate. Human IgG is separated into four subclasses denoted IgG1, IgG2, IgG3, and IgG4.9 Each subclass varies in abundance and biological function. IgG1 and IgG3 are predominantly responsible for antibody protection against reinfection. IgG2 antibodies are opsonic (marking a pathogen for ingestion and destruction) and develop in response to carbohydrate polysaccharide antigens. IgG4 molecules function as skin-sensitising immunoglobulins and are thought to block antibodies produced in response to chronic exposure to antigens. The goal of IgG-mediated food allergy testing is to identify foods that are capable of triggering a large number of adverse reactions. IgG1, IgG2, and IgG3 are all capable of causing inflammation. IgG1, IgG2, and IgG3 antibodies attached to food antigens form large immune complexes or lattices that activate complement proteins and increase inflammation. IgG4 antibodies that are present with food antigens will not usually trigger inflammation, though high levels of these antibodies does indicate the presence of immune reactions against food antigens. While most laboratories only provide a measurement of IgG4 molecules, The Great Plains Laboratory provides a measurement of total IgG antibodies to various food-based antigens and Candida, a genus of yeast native to the GI tract. Testing for only IgG4 antibodies limits the ability of the clinician to identify those foods that may be causing significant clinical reactions in their patients. IgG4 antibodies usually represent less than 6% of the total IgG antibodies. The importance of measuring all subtypes of IgG antibodies is highlighted in an article by Kemeny et al.12 They found that IgG1 antibodies to gluten were elevated in all 20 patients with coeliac disease but none of the patients had elevated IgG4 antibodies to gluten. Helps determine if food reactions are contributing to physical or mental symptoms, and much more quickly than eliminating and then reintroducing each suspect food one-by-one over a period of time. Removal of highly reactive foods from the diet is a non-invasive, therapy that often mitigates a patient’s symptoms. Research and clinical studies suggest food allergies identified by IgG testing can be major contributing factors to many chronic health conditions. Eliminating all identified food allergens after testing can reduce stress on the immune system, decrease inflammation (helping to heal “leaky gut”), resolve food cravings, and reduce the potential for eating disorders. At The Great Plains Laboratory, IgG food test results are obtained using an ELISA (Enzyme Linked Immunosorbent Assay), which is performed both manually and with robotic automation. Several different methods of quality control are used to ensure the accuracy and reliability of their IgG ELISA analysis. Once test results are available for review, The Great Plains Lab QA team carefully verifies that quality control measures are within instrument and assay specifications.